We are grateful to Dr. Bayés de Luna for his suggestions and comments about this article. The mechanisms involved in the spread of stimuli from the sinus node across the atria are still today, somewhat controversial. It is generally accepted that are conducted through the right atrium to the AV node by a preferential pathways. There are three preferential anatomic conduction pathways: anterior, middle and posterior internodal tracts. Moreover, the stimulus is transmitted to the left atrium by Bachmann's bundle, a branch of the anterior internodal tract, passing between the superior vena cava and the ascending aorta. It is the main activation pathway of the left atrium (not the only one). 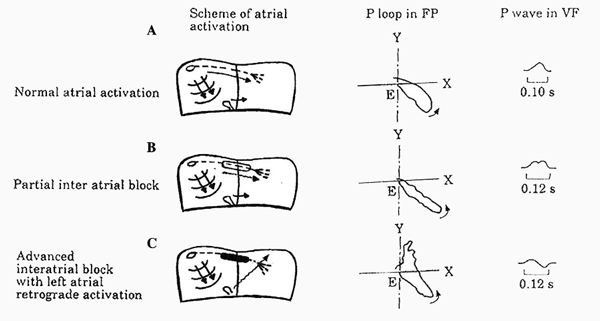 In 1979 Bayés de Luna described atrial conduction blocks and classified them as inter- and intra-atrial. Interatrial block refer to conduction disorders located between the atria, whereas intra-atrial blocks occur within the same atrium 1. Interatrial block is the most frequent and relevant blocks at the atrial level and it mean that exist a conduction disorder between the right and left atrium 2. The conduction disorder may be located in any part of the atria, however in the case of advanced interatrial block involves, especially the upper part of the interatrial zone around the Bachmann's bundle 2. Interatrial block is often found in the elderly in the absence of associated left atrial enlargement. Recently, it has been shown to be a marker of atrial fibrillation 1. Bayés et al. defined interatrial block as a conduction delay between the atria in the zone of Bachmann’s bundle, with P wave duration ≥120 ms.
Interatrial blocks can be classified as partial or advance block. They can also be classified as first, second or third degree 1. First degree corresponds to partial interatrial block and third degree corresponds to advanced block. Second degree block is not included in the previous classification 1 2. In partial interatrial block the electrical impulse is conducted from the rigth atrium to left atrium through the normal propagation route but with a delay at the Bachmann's bundle region 1. Wide and notched P wave. P wave duration ≥ 120 ms, and is usually bimodal (“notched”) in leads I, II, III and aVF, and sometimes in leads V4-V6. The P wave electrical axis is normal. In the presence of partial interatrial block, left atrial enlargement is relatively common. In fact, it has been considered that the wide and bimodal P wave of left atrial enlargement is better explained because of underlying interatrial block than the longer distance that the impulse has to go across 1. Advanced interatrial block is an infrequent (approximately 1 percent of patients with valve heart disease) but a very easily recognizable EKG pattern 3. P wave duration is ≥120 ms.
P wave morphology in inferior leads (II, III, aVF) is biphasic or “positive-negative”. Wide and biphasic P wave in inferior leads. Sometimes, the initial positive component of the P wave on inferior leads may be very small mimicking a completely negative P wave, suggesting a junctional rhythm. However, the P wave is sinus because the positive polarity in the other leads especially V5-V6, confirms the sinus origin. Image courtesy of Dr. Bayés de Luna. A P wave with a negative final component in lead aVF is required to diagnose advaced interatrial block (previous image), because left atrium has a retrograde activation. Similarly to the AV blocks or sinoatrial blocks, interatrial block may occur transiently on a beat-to-beat basis. The P wave may show transient morphology changes in the same EKG recording from normal morphology to interatrial block pattern or from partial interatrial block to advanced interatrial block pattern or viceversa 1 3. The presence of third degree interatrial block has been associated with supraventricular arrhythmias, such as premature atrial complexes, atrial flutter, but especially atrial fibrillation 3 4. This association between advanced interatrial block and supraventricular arrhythmias constitutes for some authors a clear arrhythmological syndrome 1 3. In 2014 Conde and Baranchuk 5 proposed to call it “Bayés Syndrome” in recognition of the first person to describe all aspects associated with this condition. Related article: Left atrial enlargement. Interatrial block pattern are not described in most of EKG books and prolonged P wave duration (wide P wave) is often interpreted as lef atrial enlargement 3 4, but these two electrocardiographic patterns are two different entities 3. The diagnosis of interatrial blocks is frequently associated to left atrial enlargement, although there are cases, especially partial interatrial blocks, without associated left atrial enlargement 3. Moreover, advanced interatrial blocks is commonly present in the setting of left atrial enlargement, it is a very specific (90%) but insensitive marker of this pathology 1 3. The morphology of the P wave in lead V1 allows presuming if there is an associated left atrial enlargement. A biphasic P wave with a distal negative component >40 ms in lead V1 may indicate associated right atrial enlargement 1 3. More information: Left atrial enlargement. 5. Conde D, Baranchuk A. Interatrial block as anatomical-electrical substrate for supraventricular arrhythmias: Bayés Syndrome. Arch Cardiol Mex 2014;84:32-40. doi: 10.1016/j.acmx.2013.10.004.